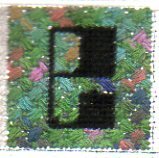 Here’s the center block for the top, a big bold lower case e. The alphabet charted below, is Computer 24 from Tink’s Alphabets Tantalizing and Terrific. The background, below, is Criss-Cross Hungarian with Crosses stitched using a limited edition silk called Brazilian Boa from The Thread Gatherer. 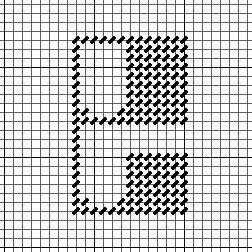 Make all the Hungarians first, using 6 strands, Then go back and using only three strands, make the little Cross Stitches. This will distribute the colors nicely. One last note about using limited edition or discontinued colors. If you are planning a large project using them, by more than you think you will need, you may not be able to find them. If you don’t have a project in mind, pick up a skein or two to use for small projects and as accents. I positively adore this color with the flashes of bright among the vivid greens, but I won’t even find more, so I hoard it and only use it for small things like this, so it will last.